The effect of the 3-Month Sadhana Retreats in yoga and meditation was measured with modern technology: Best possible balance between the two brain halves, better relaxation and considerably less anxiety and restlessness. Psychophysiology is the scientific method to explore the connection between psychological and physiological processes. Through this method, you are able to study, more objectively, states of consciousness such as sleep and dreams, meditative and hypnotic states. In this article, we see how this method can be used for measuring the effects of the meditation and yoga methods of the 3-Month Retreat as a whole. The study was performed by neuropsychologist Erik Hoffmann Ph.D. and Engineer M.Sc., Per Gaarde-Nissen was in charge of the EEG technology. In the North, Scandinavian Yoga and Meditation School offers courses on different levels in the several thousand year old tradition of Tantric yoga and meditation. These methods have not been scientifically explored to the same extent as, for instance, Transcendental Meditation. It was, therefore, obvious that we should conduct a study on the Tantric yoga and meditation methods. We chose to study students on the 3-Month Retreats. Our research took place from 1986 to 1991. The description here is from the first research in 1986. The study conducted in the following years were more comprehensive, but did, however, show similar results. A total of 32 students volunteered to be measured at the beginning and at the end of the retreat. In addition, every person was initially subjected to a psychological anxiety test (the Taylor Test). The latest electronic equipment was used, and the measurements were directly analysed by an integrated computer. In the first year, the project was divided into two independent researches. 12 students took part in a study of the autonomous nervous system, while the remaining 20 had their brain waves (EEG) measured. The purpose was to study the possible effects of the course on the autonomous nervous system and on the brain – two of the most important biological systems in the human being. The autonomous nervous system is divided into the sympathetic and the parasympathetic nervous system, with direct opposing effects on the brain and on most glands and organs. These two systems are in charge of bringing the body into either a state of activity or rest. To see the relationship between the two, the electrical skin resistance (BSR = Basal Skin Resistance) is measured. In a mentally and/or physically active person the sympathetic nervous system dominates, which for instance, results in a rapid pulse, a high blood pressure and a low electrical skin resistance. With a sleepy, very tired or deeply relaxed person, the opposite is seen: a slow pulse, a low blood pressure and a high skin resistance, which shows that the parasympathetic system dominates. In a mentally healthy person, you see a purposeful balance between the two systems, when they adapt to the demands of the surroundings. Mentally strained, stressed and tense people often have an almost chronic dominance of the sympathetic nervous system. This may result in sleeping problems, headaches, etc. These people often perspire a lot – especially from the palms, which gives a low skin resistance. On the other hand, a permanent parasympathetic dominance can be observed in chronically tired and depressive people, who also measure a very high skin resistance. Both these types of people consequently have a badly balanced and inflexible autonomous nervous system, which is reflected in a permanent and abnormally low or high skin resistance (BSR). Furthermore, with both types – to the extent that they are anxious and worried – one can measure small momentary drops in their skin resistance (skin reflexes, called GSR = Galvanic Skin Response). Normally, a skin reflex is released when a person is exposed to an external influence. It is then called specific, and is a physiological sign that the person is attentive and reactive. Scientific research, however, has shown that people suffering from anxiety neurosis and nervousness have a tendency to release many skin reflexes, even when they are lying down, relaxed and totally undisturbed. Such reflexes are described as unspecific or spontaneous and are ascribed to (emotional) processes in the individual. The more anxious a person is, the more spontaneous skin reflexes can be measured during rest. Each student had electrodes attached to the index and middle finger of the left hand, where the level of the skin resistance (BSR) and the number of spontaneous skin reflexes (GSR) were measured. During the approximately 15 minutes of the measurements, the subject was lying on the back on a couch in a sound proof room. The student was asked to relax for 8 minutes. We measured his/her BSR at the beginning and at the end of this period. By dividing the value at the start into the value at the conclusion, a BSR index was created, which showed the pupil’s ability to relax. This index increased for the group as a whole from 1,44 before the course to 1,70 at the end. It was thus documented that the ability to relax had improved considerably and that the autonomous nervous system, in this way, had become more flexible. The measurements of the number of spontaneous skin reflexes (GSR) showed a decrease from 30 units before the course to 9 by the end of the course. This indicates a strongly increased stability in the autonomous nervous system. After that, we compared this result with the result of the anxiety test and found a very clear connection: When the spontaneous GSR’s were less, the result in the anxiety test was better. On the basis of this and other similar scientific findings, it is safe to conclude that, after the course, the students were far more calm and less anxious than when they came. A conclusion which the students confirmed themselves. Skull of an old Egyptian. The snake is the symbol of energy in many cultures – on this skull can be seen two cobras. They, no doubt, stand for the nervous energy in the two brain halves. In the yoga tradition, this knowledge is preserved under the name of Swara Yoga. Different yoga methods aim at creating a balance between the energies in the two halves of the body and of the brain, between sun and moon, between Ha and Tha, but neither in Egypt nor in yoga is it about the ‘anatomical’ parts of the body, but of the different kind of energies (ed.). In the human brain, an incessant electrical activity of a rhythmical nature is taking place, the so-called brain waves. Measurement of these by electrodes attached to the scalp is called electroencephalography (EEG). The rhythms most interesting in this connection are called alpha waves (with a frequency of approx. 10cps/sec). Scientific studies have shown that the amount of alpha waves increases during meditation and there are many indications that people who meditate in general have more alpha waves. There are more alpha waves when a person has the eyes closed, is mentally relaxed and maintains a passive awareness. When the eyes are opened or the person is distracted, the alpha rhythms are reduced in favour of the quicker beta rhythms – that is, the brain is activated. The amount of alpha waves therefore shows to what extent the brain is in a state of relaxed awareness. Today, it is presumably common knowledge that the left brain half governs language, as well as logic and analytical thinking. The right brain half, on the other hand, thinks in pictures, sensations and feelings – it sees the overall view, is spontaneous and intuitive. The biological foundation for the creative expression of an individual is therefore a “correct” balance and communication between the two brain halves. The study of this balance was the focus of the investigation. Therefore, we used the ratio between the amount of alpha waves in the right and the left brain half (the RightlLeft ratio) to show this balance. Now, you might think that a correct balance would show a R/L ratio of 1,00 – that is a 100% symmetry between the left and the right side of the brain. However, that is not the case – not in our culture anyway, where greater emphasis is placed on developing skills connected to the left brain half. With mentally healthy human beings, an ideal R/L ratio is 1,05 – 1,10 – a little higher (culturally determined?) activity in the left compared to the right side. In deep relaxation, though, human beings come nearer to a balance of 1,00 between the brain halves. On the other hand, with neurotic and psychiatric patients, an R/L ratio far below 1,00 is found. The greater the mental disturbance, the lower the ratio: People suffering from anxiety neurosis, for instance, show values from 0,93 to extremely low values of 0,50 – 0,60 with paranoid people (Hoffmann,1982). Twenty right handed students participated in this first investigation (1986). Electrodes were mounted above the left and the right temple, and the students were asked to lie down on the couch and relax with their eyes closed. The EEG machine and the computer were started, and data was gathered and analysed for a period of 10 minutes. Similar to other studies of meditation, we found a clear increase in the amount of alpha waves in the right brain half, which shows a better relaxation of the right side of the brain by the end of the course. The alpha waves in the left brain half surprisingly remained completely unchanged. This gave an increase in the R/L ratio from 0,98 to 1,07, which according to the previous considerations must be considered a positive stabilisation of the balance between the two halves of the brain. To further support this observation, at the start of the course, we had found that students with a high R/L ratio (1,05 – 1,10) managed well in the anxiety test. The increased amount of alpha waves in the right brain half was seen in the first study. In the following years, we also tested several participants with predominating activity in the right side – these too, achieved an ideal balance during the course. These biological changes all signify generally improved relaxation and stability, as well as less anxiety and unrest in the students by the end of the course. 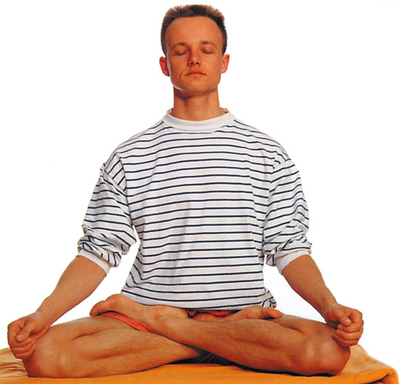 Note: all the results were found during ordinary relaxation and not during meditation, as in most comparable studies. This indicates a more permanent long-term effect. Previous research by Hoffmann (1982) with people who had been in therapy for 18 months, showed a similar improved balance in the brain. However, the difference with the students of the 3-Month Retreat was that the amplitude (that is, the intensity of the impulses or the height of the alpha waves – unlike quantity or frequency), reached a common high level. On the other hand, in the therapy, the amplitude decreased in the brain half which was the strongest in the beginning – down to the level of the weaker. When the amplitude is high, more brain cells work in the same direction, and the person is in a state of concentration. The Kriya Yoga articles naturally describe more about the content of the 3-Month Retreat, than the results of the measurements. The question is whether all our students are equally interested in this kind of research. The studies offer a somewhat superficial picture of what happens on a course, in your own meditation and in life. However, one thing is clear. No matter what your goal is with yoga, the measurements confirm that yoga and meditation have positive “side effects” – you become healthier and better able to live your daily life.